To make something unique, tailored, special only to you, & created solely for you ... that’s an incredible thing . & I truly believe that’s how your wedding day/week should be . Handcrafted & made unique to fit you & your relationship . You’ve grown this love, nurtured it and cared for it, fought for it relentlessly . So on the day when you vow to stay committed to that love, it’s only natural that things unique for you will play a part . Traditions are beautiful and meaningful . And so is that act of creating new traditions . Charles & Abby’s day was just that, unlike any other . Truly personalized to them bringing in elements they find meaningful and moving in their relationship . With only family being invited to their destination wedding in Scottsdale, Arizona, it really set the scene for intimacy . When I walked into Abby’s bridal room at sunrise on a Monday morning, there was coffee & tea brewing, bare feet moving slowly around the room, a sense of peace . No stress . No rush . Abby’s mom did her makeup, and was on point . With Abby being a wedding florist + photographer herself, she was attentive to detail, making it fun and easy for me to shoot her rose gold everything details . Quirky jewelry to make true statements, killer shoes from Calvin Klein, and the most gorgTruvelle flowy, silver-blue dress I couldn’t take my eyes off of . Charles was dressed to the nines in his H&M / Nordstrom / Yves Saint Laurent ensemble . He himself cut off the collar to create a more edgy style that suited him . An 8am first look straight from heaven had us all smiling and swooning . We then drove to the ceremony at the McDowell Sonoran Preserve, where 25 of their family members waited to witness this sweet & wild love to be vowed together . 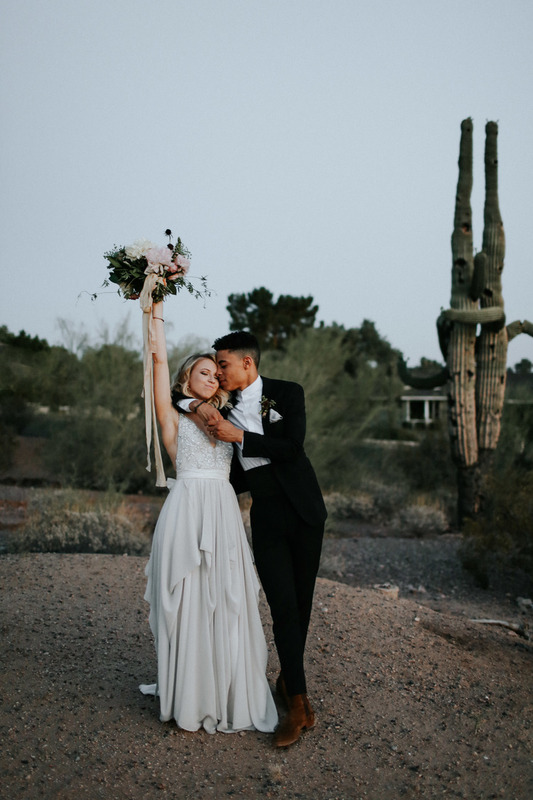 Bright blue skies, desert vibes surrounding us, and everyone dressed to kill, Charles & Abby read their written vows to each other, cried and laughed and prayed and squeeled in disbelief this was all happening . Jesus was present and it was a tangible, moving thing to witness . Brunch afterward at the Henry made all our hunger dreams come true, and was a solid 10 with décor, giving us awesome aesthetics to shoot some portraits (Abby thought this all through :)). We parted ways for the day until evening when we got to spend a little extra VIP time with the newlyweds . We drove them out to a spot in the desert right as the sun was setting, giving us tones only the desert at twilight could provide, and just let them do their thing .